During my first two years of Undergrad, I have shadowed a handful of doctors. I originally thought that I wanted to go into orthopedics, but after shadowing I am now unsure. I am currently leaning towards ophthalmology or optometrist. I will finish my B.S. in biochemistry and minor in Spanish. I will take the OAT either next winter or early spring. I also plan on participating often in Eyes on Health and in the pre-optometry club. I have also set up opportunities to shadow more optometrists this summer and plan on getting in around 50 hours of shadowing. In addition to shadowing, studying for the OAT, and volunteering, I am taking physics so that I can get both 1250 and 1251 in before taking the OAT. I also plan on staying active in the Biological Sciences Scholar group. Coming into college I wanted to be an orthopedic surgeon. However, after shadowing two orthopedic surgeons and various other doctors, I have decided that optometry seems to be better for me. I still plan on completing my B.S. in Biochemistry and a minor in Spanish. With the help of my academic advisor, I have planned out all the classes that I take until graduation. I plan on taking the OAT either this coming winter or next spring. This year was a pivotal year for me. Academics wise, I started my first Biochemistry class which was exciting to finally take after all the prerequisites. It was somewhat a relief to see that I actually enjoyed my major’s class because I have many more biochemistry class to come. I am continuing my Spanish minor and enjoy learning the language more and more as time goes on. One major change to my future plans is that I switched from pre-medicine to pre-optometry. My father is an optometrist and after shadowing various doctors, I have decided that I would enjoy going into business with my dad the most. I have or will have completed all the prerequisites for optometry school through my major, so I do not have to rearrange classes. Finally, I made many new friends this year through my classes and living in an eight person suite. I also actively participated in the biological Sciences Scholar program and joined the organization, Eyes on Health and the pre-optometry club. This semester I had the opportunity to volunteer at the Greater Dover New Philadelphia Food Pantry. The Dover, New Philadelphia area has a large Hispanic population and many people in the area cannot speak English. 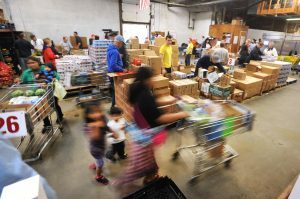 This food pantry has a hard time providing for these people because of a shortage of translators. I am a Spanish minor and while my Spanish is far from perfect I know enough to help people find the food they need. When I heard that they needed volunteers that knew some Spanish I was eager to help out. It ended up being one of the best volunteering experiences of my life because I got to apply what I was learning in school to helping others. This particular pantry is 2 hours from Columbus in my home town, so volunteering here throughout the semester is difficult. One of my friends informed me of the Clintonville Beechwold Community Resources Center Food, a pantry a short distance from campus. I got the opportunity to volunteer there towards the end of the semester and hope to return next semester. This event has been held for the past couple years now, and each time the goal is too plant tons of trees. This year we planted thousands of trees along the Olentangey river near OSU campus. The trees we planted will hopefully out compete the invasive species. The process seems to be working because we can see the progress from last year. It was a great event. It was well organized and many people came to help. Before this I would have never imagined so many trees could be planted in one day! G= Global Awareness. I plan on gaining a sense of global awareness by studying abroad. I am currently working towards my Spanish minor, which may turn into a second major, and I hope to take Spanish classes abroad. Hopefully I will get the chance to study abroad in Chile, Argentina, or Spain. O= Original Inquiry. I plan on doing undergraduate research during my second or third year. I am waiting to apply to a position that interests me. I believe that research would be a great way for me to gain experience working in a scientific environment and that it would be a great way for me to apply what I am learning at OSU. A= Academic Enrichment. I am a Biochemistry major with a minor in Spanish. So far in my academic en-devours, I have made great progress in my ability to express my thoughts in Spanish and in scientific writing. I enjoy learning new scientific and cultural concepts and plan on continuing the learning process for years to come. L= Leadership Development. I plan on getting involved in organizations and clubs that are meaningful to me. Once I find what interests me I will pursue a leadership position within them. It is important to have a leadership position because you exercise the ability to work with others and can make a large difference in whatever you do. I recently joined the pre-optometry club and the Eyes on Health organization. S= Service Engagement. I have been actively participating in many service opportunities in the Columbus area. I have raised money for various organizations such as the American Heart Association and Steps for Sarcoma. I have also planted trees along the Olentangy river. I have baked food for a food pantry and participated in multiple walks/runs for awareness of many issues. I really enjoy being able to give back and support others. It feels good to take the time to help those who need it the most. I have also volunteered at two different food pantries multiple times. I also volunteered at Wesley Glen a couple times and I am considering becoming a STNA so that I can help out more at nursing homes and hospital in the Columbus area while taking my classes at OSU. During my time at OSU, I have grown as a person, leader, and a peer mentor. I participated on the Biological scholars flag football team and this helped me with my leadership and teamwork skills. I also took part in both Steps for Sarcoma and the Heart Walk. These events helped me gain perspective on what a can be thankful for, and helped me realize that helpful, giving, communities are all around us. When I entered the Scholars program I did not have many experiences outside my hometown. Being in this program helped me explore the campus and Columbus and helped me find many rewarding opportunities. It also helped me meet people that had similar goals as me. Now I have a greater perspective on the world and I believe that I am a lot better off because of it. Personal growth helps us gain context because we can realize where we were and where we want to go. It can also be a humbling experience to realize that there is always room for improvement. It is important to reflect back because this is how you can realize what you have become and to see how much growth you have experienced. This can then be compared to your goals and used to gauge how well you are on your way. G– Global Awareness Global awareness means to have an international focus; studying, researching, or interning abroad; or volunteering, working, or participating in student organizations abroad. From this, students should gain appreciation for diversity. I plan on achieving this goal through studying abroad and possibly through doing service work in other countries. O– Original Inquiry Students should be involved in research and creativy projects to gain an understanding of the research process. This can be across campus or global. I plan on achieving this goal by participating in research either my second semester of my first year or my second year at OSU. A– Academic Enrichment Students should pursue academically rigorous endeavors above the OSU norm. Then apply what they have learned to their future careers. I plan on achieving this goal by taking rigorous classes to be competitive when applying to medical school. I will use what I learn throughout my years of education to be a good doctor. L- Leadership development Students should develop solid leadership skills in the classroom, community, and a variety of activities. Students should recognize their skills and choose positions that would be best for them. I plan on achieving this goal in multiple ways. I plan on being the leader of an intramural basketball team. I also plan on being a leader in the classroom and I would like to pursue a leadership position in a club that is important to me. S- Service Engagement Students should recognize their interests and seek out volunteer opportunities in such areas of interest. Students should want to serve their community and society. Another important aspect to this is that students can reflect on what they have experienced and realize what they have learned or gained from giving back. I plan on achieving this goal by participating in plenty of volunteering programs and opportunities. I have an interest in the medical field, so most of my service should be targeted in that field.